Fighting has always been a big part of Irish culture, and surely everyone has heard the term “The fighting Irish”. Even tattoos and emblems have been devoted to this term. And at this stage, I trust everyone has heard about the new Irish hero, Conor McGregor. This is why I jumped at the chance of accompanying a local Muay Thai club, called the Siam Warriors, to their cage fight event. It was predominantly a competition between the Siam Warriors, which are based in Cork, and other Muay Thai clubs from neighbouring counties. 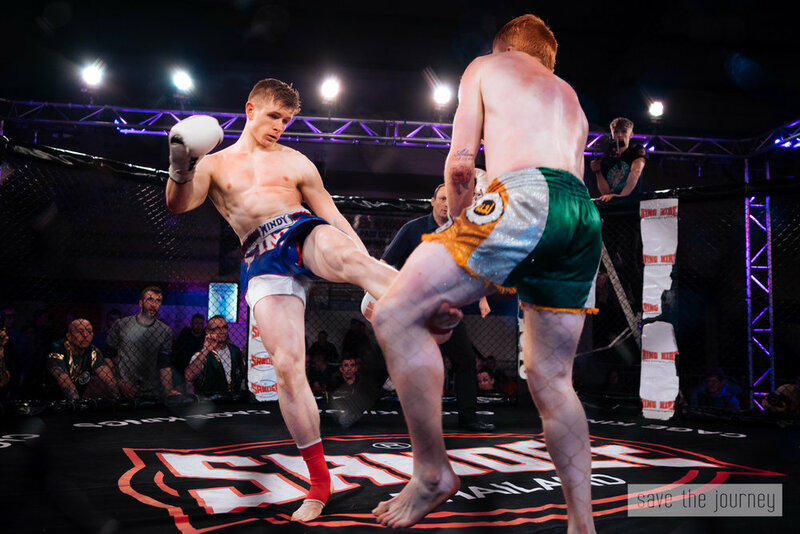 Having never been to any form of fighting event, be it boxing or cage fighting, it was an atmosphere that I at first struggled to feel at ease in. The first sight of the ambulances parked at the back entrance of the venue hit me with a heavy confirmation that this is an evening where people are going to be hurt and injured in the spotlights. Living in such a safe 21st century, these moments always remind me how civilized we have become, yet pondering if that is a good thing. For the first two fights, I didn't photograph much, but just took it all in and tried to get accustomed to this testosterone laden venue which hung thick in the air. It wasn't an aggressive or dangerous atmosphere but the strong scent of manliness was not to be missed. Having a photography/press pass is one of the greatest privileges one can hope for at such an event, so I pushed my luck and made my way to the backstage locker rooms. Being stopped by security twice on the way, I simply waved my camera and shouting over the wall of noise, I re-affirmed that I am one of the photographers of the evening. And just like that, I was backstage. 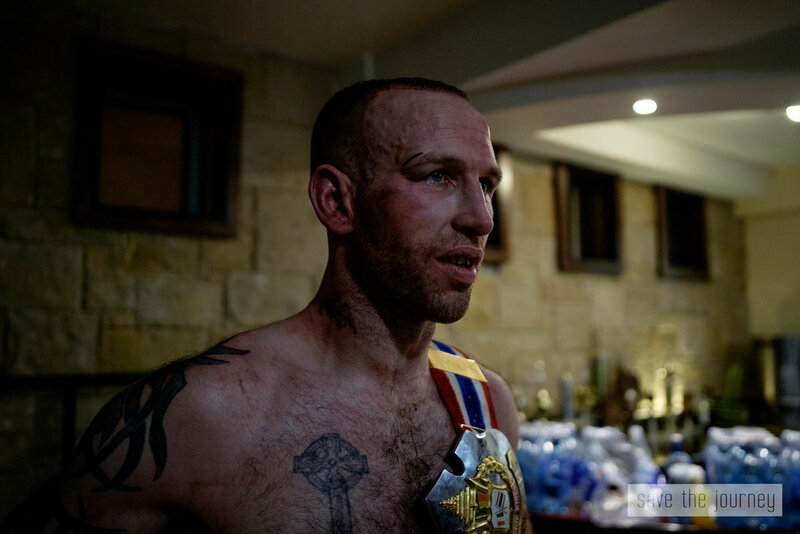 While all the other photographers were there to photograph the fights itself, I was more interested in getting to know the fighters, taking photos of their preparation for their impending fight and being there with them through the highs and lows of the evening. I picked out certain fighters, and would accompany some of them to their fights. The fighters were all very polite, surprisingly relaxed around me and eventhough I stuck with them the whole evening, taking photo after photo, not once was I told to back off or leave them alone. Although I was always sure to give them space and respect them, I would totally have understood if one of them had lashed out at me in a flurry of nerves or a wave of disappointment and frustration of having lost a fight. That was the most difficult part of the whole evening, seeing on of "my" fighters lose. I came to the event knowing no-one, and as I started forming these very intimate friendships with them in the locker room, it was heartbreaking to then see them in the cage getting wobbled, watching in despair as their arms fell lower and lower, visibly becoming heavier, and eventhough they fought with all of their heart and determination it just wasn't enough. I was with them as they limped back to the locker rooms to be assessed by the medics. It just couldn't be any lower of a moment. You can see the fighter's world crumble and the frustration is deafening in the room. One particular fighter had the misfortune of losing a fight in the first 20 seconds or so of the first round by a kick to the head. As it was a TKO he is not allowed to fight for the next few weeks for medical and safety reasons. Unfortunately, he would miss his upcoming fight that he was scheduled to partake in, in two weeks. Just an unfortunately terrible evening for him, which should have gone much better for him, though these things just happen in cage fights. But in a heavy contrast, watching a fighter dominate the other from the get go and winning through his dedication to his training and his precise skill and execution is just incredible. In that moment happiness doesn't even begin to explain the infectious emotion that that fighter is experiencing. In that moment, nothing seems impossible and pride is bursting out of all seams. The extremes between these highs and lows really were incredible to witness, and I absolutely understand why someone would go through all of this. It almost seems that that amazing winning emotion is not beatable by any drug but just as addictive. “The fighting Irish”. From what I got to experience that night, I feel like this is the wrong term to be using. What I saw that night, was a deep level of friendship and brotherhood among the fighters, and a deep level of respect. Outside of the octagon, there was no aggression, there was no anger but mountains of support for the current fighter and calm faces all around. And for those fighters who lost, they didn't feel embarrassed but felt disappointed with themselves and couldn't wait to get back into the octagon to amend what had gone wrong. Just like them, I can not wait for my next fighting event. On this primal level, and I do not mean that in a derogative way, it is a refreshing adjustment to everyday life. On this level, I immediately knew where I was at with everyone, I was immediately told either verbally or through body language if I was being accepted in the group or if I was being disruptive. There was no politeness or cover ups, or the typical Irish “ah sure, no don't worry about, it's grand”. No pretence. Respect the group and they will respect you.